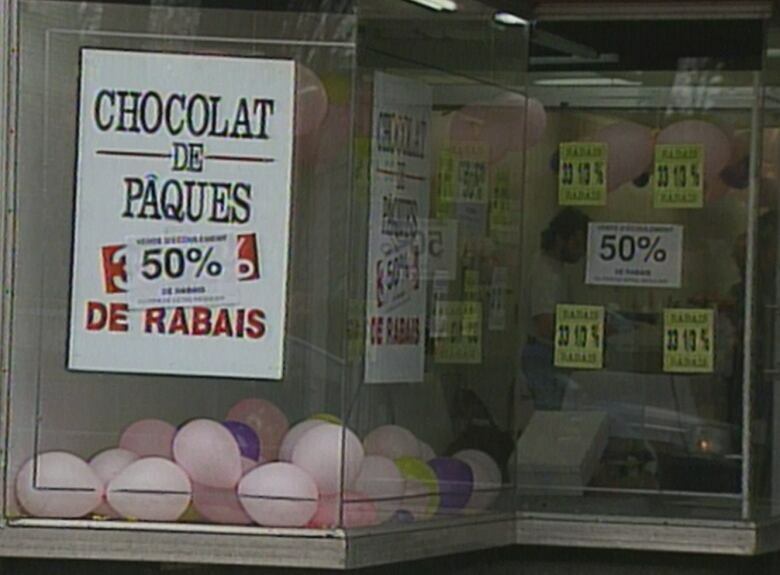 A Montreal chocolate vendor was irate about temporary competition that was undercutting her prices before Easter in 1995. Like tulips, they popped up in spring. But the effect discount chocolate dealers had on the retail scene in Montreal wasn't pretty, according to their competition. "They won't be here on Sunday," said Christiane Lavallée, who owned a year-round chocolate shop. "I will be here to serve my clients." Lavallée was annoyed by temporary shops that opened just in time to take advantage of demand for Easter chocolate and closed just as quickly. One such store, stocking stacks of boxed bunnies and apparently not much else, sat right next door. "It's a type of chocolate war," Lavallée said in her bustling shop the day before Easter in 1995. "They're setting up everywhere without permits and taking away our business." Having lost 50 per cent of her business to a here-today-gone-tomorrow neighbour, she had joined forces with other full-time merchants to encourage a consumer boycott of the temporary stores. Next door was just as busy, with consumers who hadn't heard about the boycott — or just wanted to keep their chocolate cheap. "During the recession, we have to take advantage of that," said a shopper buying a massive bunny. She said she understood that the pop-up shop was "not very good" for long-term businesses, but the price was what mattered to her. The undercutting pop-up phenomenon wasn't unique to Montreal, apparently. "Other cities have already banned temporary chocolate shops like this one," said CBC reporter Genevieve Beauchemin. "And the merchants here hope City Hall does the same, to put an end to the bunny wars."